Looking for that perfect iTunes' upgrade? Look no further than ImTOO iPhone Works for Mac. This multipurpose Mac iPhone backup, copy, convert tool takes all of your frustrations out of iTunes' limitations. 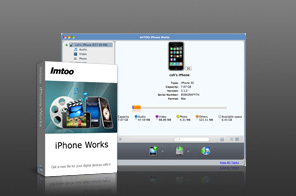 ImTOO iPhone Works for Mac allows you to move files freely between your iPhone, Mac and iTunes, convert CDs/DVDs to your iPhone, and transfer DVD folders and ISO images to your iPhone. Newly support iTunes 9.2. Still not impressed? Install ImTOO iPhone Works for Mac on your Mac and copy files freely between your Mac and iPhone. And of course, it comes with all the regular file management features that iTunes has. And it's fully compatible with all iPhone models. To see just how the ImTOO iPhone Works can work wonders with your iPhone, simply try it out for yourself FREE! The best iTunes alternative for iPhone to backing up apps, movies, music and photos from iPhone to Mac, and copying files from Mac to iPhone. You can also manage documents for some apps now. Copy iPhone movies and music to iTunes quickly and easily. Newly support iTunes 10.6. Fully support all iPhone models: iPhone, iPhone 3G, iPhone 3GS, iPhone 4 and even iPod touch. Automatically identify iPhone and display device information such as model, capacity, and serial number. Transfer apps between Mac and your devices, also manage documents for some apps. Edit the ID3 tag information of several files simultaneously such as title, album, composer, year and so on. View files in list or thumbnail mode; add and edit album covers in thumbnail mode. Easy-to-use multilingual interface available in English, German, French, Spanish, Traditional Chinese, Simplified Chinese and Japanese.